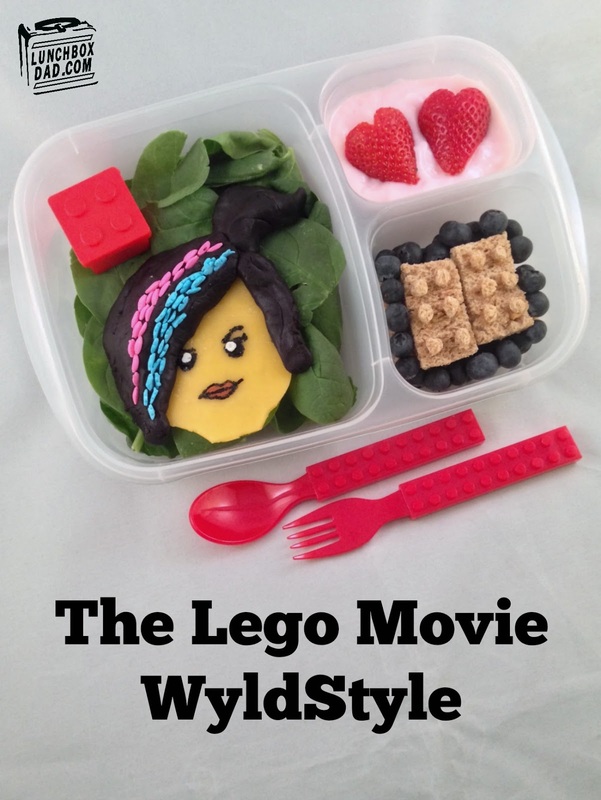 Year 2, Week 35: The Lego Movie Wyldstyle. Everything is Awesome today in my kids' lunches! They have gone crazy for The Lego Movie and want to sing Everything is Awesome over and over (when they're not singing Frozen). Since there are only two more weeks left in school I thought I would make a Wyldstyle Lego lunch for my daughter. 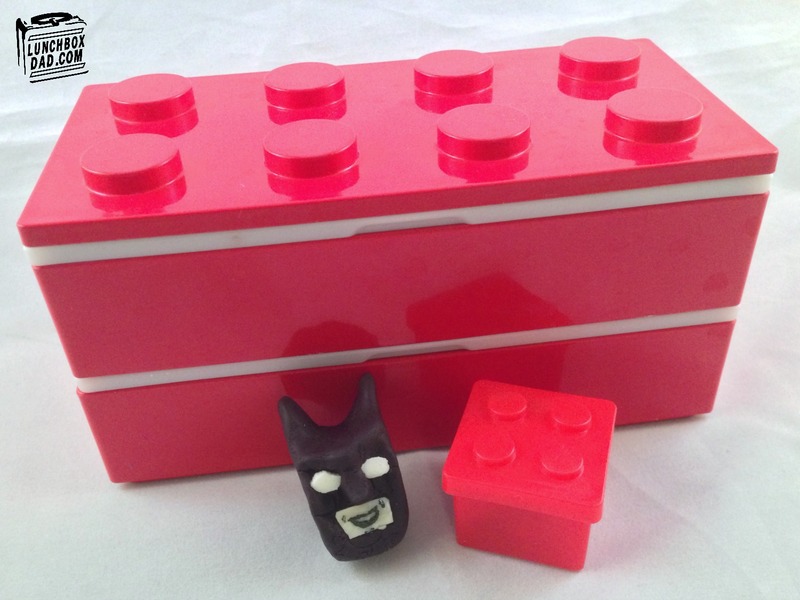 I also made lunch for my son in a Lego Bento Box with a Lego Batman head. Hopefully this won't start more chants of Everything is Awesome, but I hope it will help them eat their lunches! 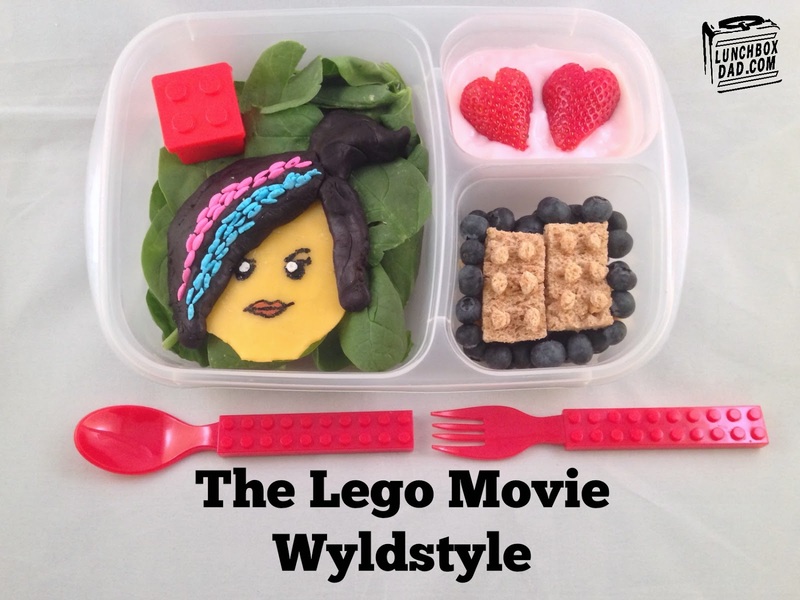 The Wyldstyle lunch is made in an Easy Lunch Boxes container while the spoons, little red bricks, and Lego bento box came from All Things For Sale. You can get a ton of great lunch equipment there at really low prices. 1. Cut cheddar cheese into Lego shaped head. It doesn't need to be exact. 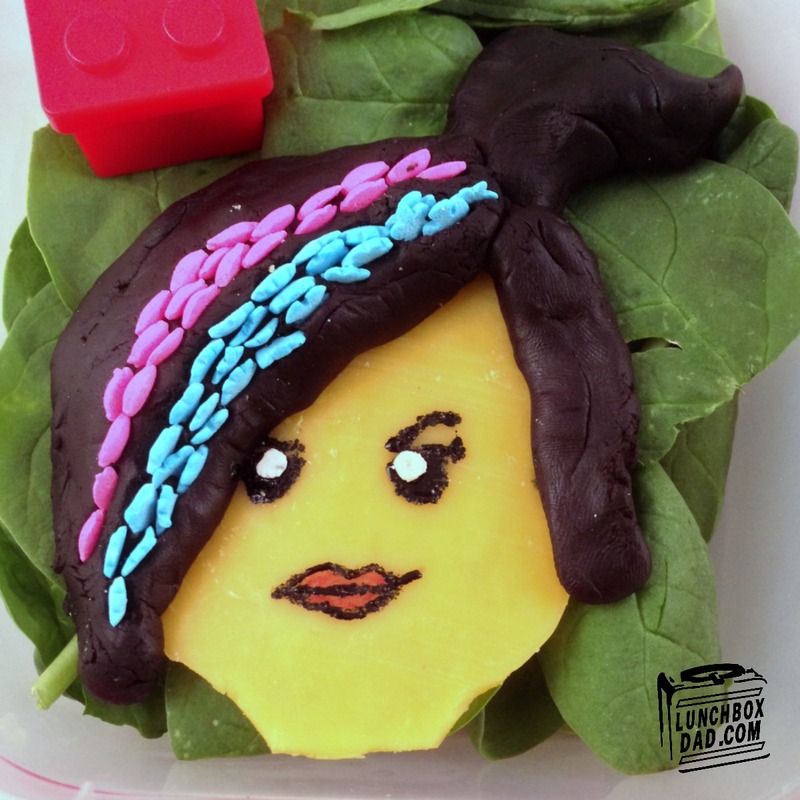 I used Wilton's edible modeling dough to make her hair. I have had it for awhile and have been excited to try it out. The clay was really easy to work with. You can find it many craft stores. 2. After you stick the hair on push pink and blue sprinkles into it. Use food coloring to make the facial features. You can use cream cheese or tiny pieces of tortilla to make the white part of the eyes. 3. Arrange fresh spinach or lettuce in the bottom of main dish. Set Wyldstyle head on top and garnish with almonds. I put them in a little Lego type dipping container. I also included Lego utensils that we had. 4. In side dish put strawberry yogurt. Cut two hearts from a strawberry that has been cut in half. Float these in the yogurt. Wyldstyle and Emmett ended up together in the movie so these represent that. 5. For the whole wheat bread Lego bricks I used a technique I found in the book Everyday Bento. Click the button to the left in my Amazon Store to order the book from Amazon. It is written by my friend Wendy from Wendolonia.com. It is easy to do but I won't tell you how because you really should buy the book, it is awesome. 6. Kids can use the cheese from Wyldstyle, the spinach (a parent can dream, right? ), and the whole wheat bread pieces to make their own sandwiches! 7. 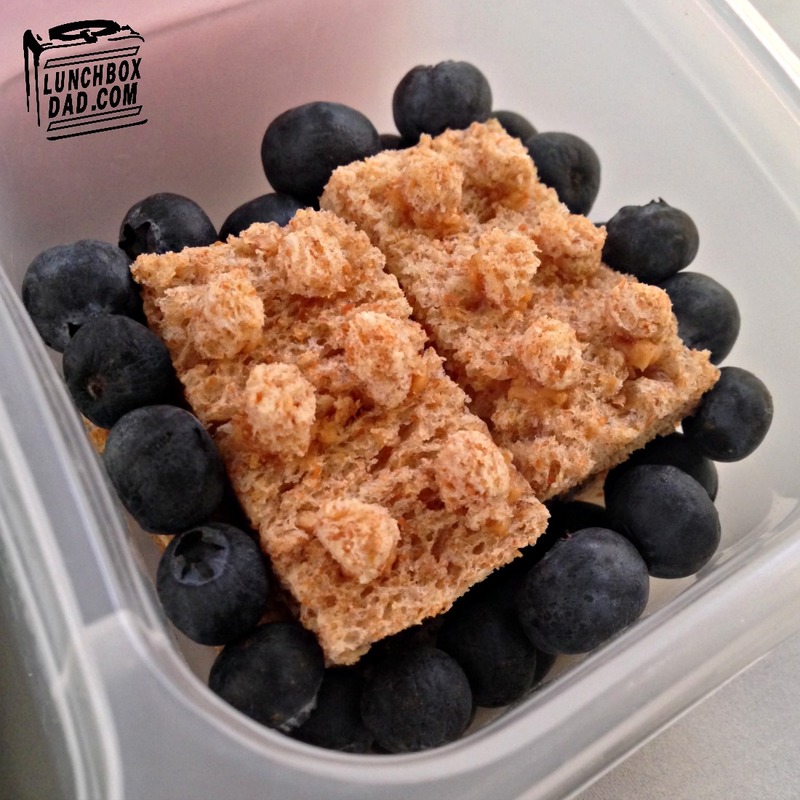 Place bread Lego bricks in second side dish and surround with blueberries. Love your LEGO lunch! too amazing and awesome! Where did you get the LEGO bento boxes from?